Left/Right hand 'Rubbolite' rear combination 24v LED lamp. Stop | Tail | Fog | Reverse | Direction Indicator. Triangle reflex reflector and DIN connector, vertical mounting. 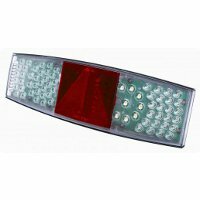 Right hand 'Rubbolite' rear combination 24v LED lamp. Stop | Tail | Fog | Reverse | Direction Indicator. Triangle reflex reflector and DIN connector, horizontal mounting. Left hand 'Rubbolite' rear combination 24v LED lamp. Stop | Tail | Fog | Reverse | Direction Indicator. Triangle reflex reflector and DIN connector, horizontal mounting. Left/Right hand 'Rubbolite' rear combination 24v LED lamp. Stop | Tail | Fog | Reverse | Direction Indicator. Square reflex reflector and DIN connector, vertical and horizontal mounting.